We have invested in the Six Month Smiles Orthodontic system which is different from the conventional metal brace in the picture. 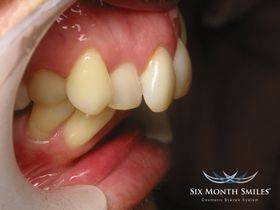 Six Month Smiles is a simplified orthodontic system to cosmetically straighten just the smile teeth using clear brackets and wires in a much shorter time than conventional orthodontics. Usually between four and nine months with an average treatment time of six months. This system is suitable for adults who have crooked, misaligned or gaps between their front teeth and want straight teeth quickly without the unsightly conventional metal braces. 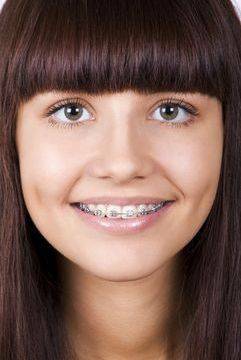 Conventional Orthodontics is still required for youngsters who require a change in jaw and bite alignment as well as straightening the teeth. This is most effective during the “growth phase” influencing jaw and bone growth as well, usually making it a lengthy process often taking between 2-3 years. Adults can have conventional orthodontics if correction of the back teeth bite, jaw profile or if a correction of the midline position of the front teeth is required. Conventional orthodontics is not available at this practice but we can offer referral to a specialist if required. Six Month Smiles can straighten the teeth but cannot correct the misplacement (front to back overlap) of the jaws As seen in these pictures. 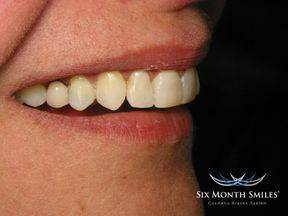 If you simply want straight front teeth quickly and you feel your back teeth meet correctly then Six Month Smiles is for you. If you what the overbite correcting then you will require conventional orthodontics. We have started a recycling scheme for plastic toothbrushes, both manual and electric brush heads; plastic toothpaste tubes (not pump dispensers as these can be recycled in normal household recycling) and the plastic packaging these items come in. You do not have to be a patient to participate, just bring them in and we’ll do the rest… By the way we will also recycle plastic crisp packets (separate please as it’s a different scheme) and better still money is raised from these is donated to Brent Lodge Wildlife Hospital. We are very proud of our achievements. You may be interested in an article in “Private Dentistry” a magazine to the dental profession about our ground-breaking sterilisation and decontamination facilities to maintain hygiene, and cleanliness. We strive to provide the best and safest care possible.